Ellevest’s tagline of “Invest Like a Woman – Because Money Is Power” brings something new to the robo-advisor community: a focus on women investors. This robo-advisor is dedicated to helping women invest by considering gender-specific financial differences. It recognizes that career breaks and the gender pay gap affect how women earn and invest. By taking these factors into account, it shares the most helpful investment planning advice for women. If you’re unfamiliar with robo-advisors, they’re companies that offer online investing in lieu of live advisors. Overall, they can help you create investment portfolios, track changes in your investments and achieve your financial goals. With everything being digital, this makes robo-advisors cheaper than traditional advisory firms. Pricing: How Much Does Ellevest Cost? Ellevest offers three different programs, each of which carries a different annual fee and minimum balance requirement. The company's Digital program does not require a minimum balance and bears an annual fee of 0.25%. Ellevest's Premium option calls for a minimum balance of $50,000 and a 0.50% fee. The Private Wealth Management program requires a minimum balance of $1 million, and fees are based on the amount of assets under management. The annual fees for these programs do not include underlying fees charged by ETF funds, which can range from 0.60% to 0.16% a year. These charges are taken from your investment account. If there isn’t enough money in the account, Ellevest sells securities to make up the difference. There are no transfer or withdrawal fees. It also offers free management on an emergency fund. This fund isn’t invested in the market, but some interest is earned on the account. The only other fee to be aware of is if you decide to transfer an IRA to another custodian. In this case, you will be initially charged a $100 transfer-out fee by FOLIOfn Investments, Inc. (Folio), which is the company that safeguards the securities and cash in your Ellevest account. However, Ellevest will reimburse that fee. Ellevest prides itself on offering personalized and diversified investment portfolios. Four different investment accounts are offered – home, business, retirement or kids – and each portfolio differs to cater to that specific goal. In addition, Ellevest offers impact portfolios, which give clients the option to invest up to half of their porfolios in companies that are making positive social impacts by putting women in leadership positions or upholding high standards for sustainability practices. Ellevest's portfolios are composed of exchanged-traded funds (ETFs). ETFs are a popular and inexpensive way to invest. They’re like mutual funds, but are tradeable, have lower fees and can easily be diversified. The company uses 21 different ETFs, also known as asset classes, to create a portfolio. This includes various stocks, bonds and real estate. With this large range of asset classes, it allows the company to easily diversify each investment portfolio. Diversification means investing in different assets, which minimizes your losses if one specific asset class does poorly. 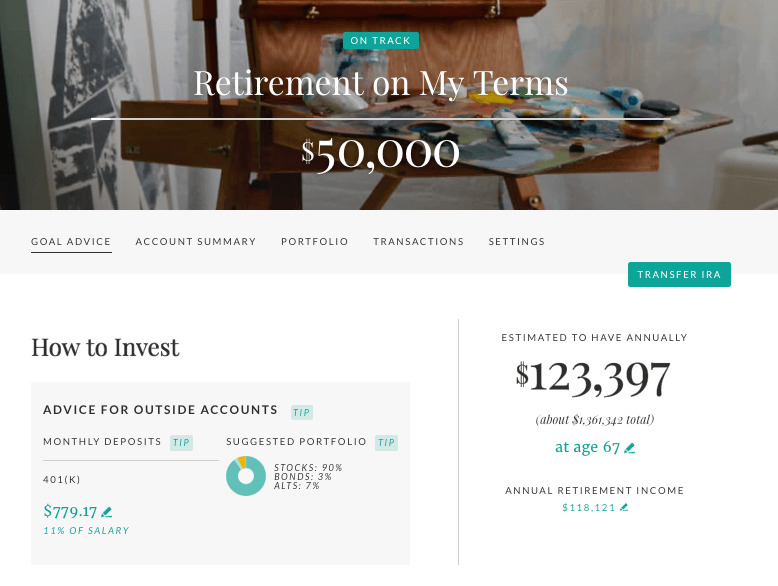 When building a portfolio, Ellevest also takes your goals and timelines into account. For example, if you set a timeline of six years to place a down payment on a home, it will most likely curate a low-risk investment portfolio because of the short timeline. But if you create a retirement investment account and are decades away from retiring, it may suggest a high-risk portfolio because your longer timeline can afford more risk. They also consider the market conditions of different ETFs. This helps with diversification. If all investments fluctuate and are not stable, it can hurt your returns. Most experts recommend a good mix. Ellevest focuses on creating investment portfolio that maximize returns, while taking on a comfortable amount of risk. Your portfolio automatically rebalances if it drifts too far away from your ideal portfolio. The value of your investments may change over time and rebalancing helps you stay on track. Once you are close to accomplishing a goal, Ellevest automatically rebalances the portfolio to invest in low-risk assets. This helps reach your goal. When compared to other robo-advisors, this one has a larger selection of ETFs. This prioritizes its goal of making diverse investment portfolios that are most helpful for you. These asset classes were chosen for their low costs and market projections. The company's portfolios are meant to increase the money going into your pocket and minimize the investment risk. It suggests portfolios that help reach your goals 70% of the time. This projection is higher than those made by other robo-advisors and traditional firms. It determines this by looking at the market projections of different investments and build your portfolio based off them. This ensures that each asset class behaves differently in various market conditions – this prevents your entire portfolio from tanking if the market behaves a certain way. In addition to these investing features, Ellevest also offers unlimited access to its concierege team, which can answer questions over the phone or by text or email. If users upgrade to Ellevest Premium, they can get one-on-one guidance from certified finacial planners (CFPs). Another feature offered to Ellevest Premium clients is executive coaching with the Ellevest career team, which includes help with negotiating a raise, switching industries and acing an interview. Although anyone can use this robo-advisor, it’s specifically targeted toward women. When giving advice, the company considers the financial issues that specifically affect women: career breaks, the gender pay gap and a longer lifespan. Investment plans take these aspects into account. If you’re a woman who is new to the investing world, Ellevest gives you the advice you need. With no minimum balance, you can invest as little as you want. You can begin to invest toward goals like a house or retirement. As you learn more about the investing world, the robo-advisor's flexibility helps you alter your goals to fit your needs. The company's emphasis on goal-based investing also helps those who are more goal-oriented. When creating investment portfolios, your timeline and aspirations are taken into account. The portfolio changes if one of those two factors changes. If you have more $25,000 in investable assets, you may want consider getting a human advisor instead. You can use SmartAsset's financial advisor matching tool to get matched with an advisor in your area who suits your needs. 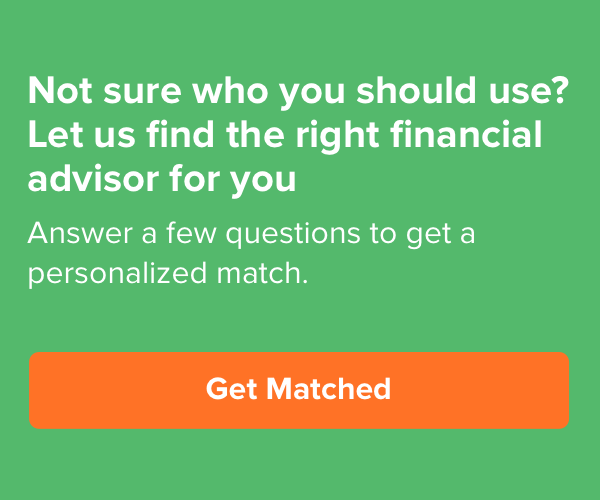 To learn more about different individual advisors in your area, explore SmartAdvisor Match. The start process is quick and easy. It claims that you can “start investing in 15 minutes.” There’s no mobile app, so everything occurs on its website. You’ll start by giving some information about yourself, like your age, education level, job and family. Then, you can begin setting up your goals. This includes starting a business, building personal wealth or buying a home. You can add as many or as little goals as you want. These goals are ranked from most to least important. After you enter your account information, Ellevest looks at savings contributions, salary projections and other variables to give advice on how to accomplish each goal. It gives an estimate of the monthly deposit and total amount needed. You can adjust your goals, timeline or goal priority based on these projections. Your investment portfolio lists each goal and breaks down the different ETFs invested in. There is also a projection for portfolio performance. The company projects a 70% likelihood that the goal will be reached, compared to the 50% that other services estimate. When you get closer to reaching a goal, the investments get more conservative to minimize risk. Once you fund your account, you can begin investing. Overall, the robo-advisor provides a personalized, goal-based investing experience. It offers a hands-off approach to investing, while still working toward your goals. With the market constantly fluctuating, Ellevest automatically rebalances your portfolio to make sure you’re kept on track. Ellevest's most basic option, its Digital program, carries a 0.25% fee. However, its Premium option has a management fee of 0.50%, which is more expensive than many other robo-advisors. There is also no tax-loss harvesting. This feature supposedly helps offset losses from taxes. Ellevest stated that tax-loss harvesting only defers taxes rather than eliminates them, so you’ll have to pay them later regardless. It’s not completely sold that that strategy is useful and efficient. However, some other robo-advisors do offer tax-loss harvesting, and some experts believe not having it is a drawback. In addition, the service tailors its strategy toward women’s goals and timelines. Though this is useful for some women, not all women share the same goals or have the same experiences. Though it's targeted toward women, that doesn’t mean that it’s the best service for all women. At the core of it, for investing purposes, similar robo-advisor services are offered at other places. Ellevest’s website can also be tricky to navigate. Though it has a clean interface, information is spread out onto multiple pages. This may make finding information difficult, since not all information for a specific topic is listed on a single page. The number of different links provided can be overwhelming. Competition: How Ellevest Stacks Up? Though Ellevest has a unique approach – targeting women who have never invested before – it joins the ranks of an already competitive field of robo-advisors. What sets it apart is its dedication to working in the best interests of women through personalized investment portfolios. Plus, its range of different ETFs shows that it values diversified portfolios for your specific financial situation. But with general investing in different ETFs, the company’s competitors offer similar services at similar prices. For example Wealthfront requires a minimum balance of $500 and a flat rate of 0.25%. Depending on the account type, Betterment’s fees range from 0.25% - 0.40%. The lower-fee option has no minimum balance but doesn’t offer access to a live advisor. Ellevest's lower-fee option does offer access to a human advisor in addition to having to minimum balance. Betterment Premium requires a minimum account balance of $100,000, which is twice as high as Ellevest Premium's $50,000. However, Betterment Premium's fee is lower, at 0.40%. Betterment also offers tax-loss harvesting. When compared to other robo-advisors, Ellevest offers similar services fora comparable fee though its Premium option is slightly more expensive. But the rate is still below that of traditional financial advisory firms. It also manages an emergency fund at no extra cost. With its goal-based savings as well, this sets you up for long-term investing. Bottom Line: Should You Use Ellevest? Ellevest is changing the way women invest by focusing on their financial needs and differences. With flexibility in goals and timelines, it’s a good option for those who have never invested before. You can start building up funds for the long term. And though the service is targeted toward women, anyone can use it. Ellevest also isn’t compatible with many different accounts. But if you want to invest with a woman-focused company, Ellevest is making a name for itself. Ellevest is not compatible with all types of accounts. Before you open any accounts, you should talk to a financial advisor so you understand exactly what your goals are what kinds of accounts you will need. If you’re investing for retirement, a good place to start is with a free retirement calculator. A calculator will show you where you stand and what you need to do in order to have enough when retirement rolls around.